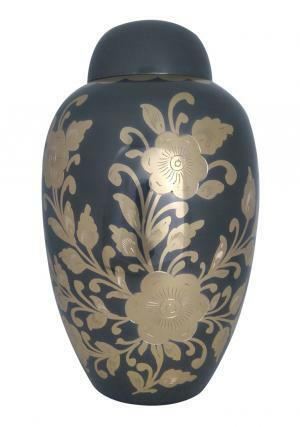 The Golden Floral Decorative Black Adult cremation urn is a decorative design made of brass metal with art work of gold flowers surrounded by black finish on the brass urn. The brass metal black urn is decorated very well with the presence of artisans work. 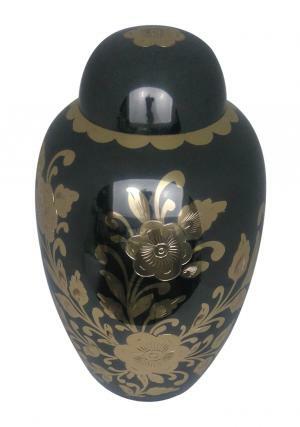 The Floral Black Memorial Adult Funeral urn has a lid on the top with decorated golden flower in a black background which has screw threading laid inside the lid for an easy closure or secure ashes inside the urn. The Dimensions of the Adult Black Cremation Urn weighs 1.67 kg with height as 10.63 inch, width as 6.5 inch and approximate storage space of 200 cubic inch capable to hold adult ashes.